Extensive Edit - I'm genuinely seeking a better understanding of this so I am putting up a new version of this question. I used an example design to make the matter easier to discuss, but it was pretty bad. I hope this one is good enough to place the topic within parameters that makes an analysis possible. Design principles: A good design will restrict heat loss through conduction into the soil by placing thermal mass such that heat needs to traverse a large distance to reach the ground, and surface area of the thermal mass in direct contact with the ground is small. This implies building tall, thick walls. Let us consider a cylinder with height equal to diameter, being 40 m, with walls of 3 m thickness. This is manageable through the use of earthbag techniques. Only the fabric bags or tubes to be filled with regolith would need to be shipped from Earth, and the equipment needed to fill and place them is also simple and wouldn't be too heavy. Placing the walls would be slow and require the movement of the loose top layer of regolith from a large area, since that layer is only 10 to 20 cm deep. On the other hand, if your equipment runs on solar power and can be operated remotely, time is cheap compared to the cost of shipping. The radiation penetrating such walls would be inconsequential, leaving only that entering through the transparent covering at the top to consider. For the sake of argument let that covering be a shallow dome of plastic sections with protective coatings, and a high-strength membrane beneath holding in the atmosphere. 50% of light passes through, reflected in by a mirror of thin aluminum sheets on a light armature. That mirror has dimensions matching that of the transparent roof, is backed with MLI (Multi-Layer Insulation that reflects EM radiation), and is lowered over the opening at night to hold in heat. During the day it tracks the sun. Let's suppose the structure is 60 degrees N or S of the equator. The transparent area of the greenhouse would receive 1700 kW if it was in full sun. At 60 degrees, it would get approximately half that amount directed into the greenhouse, between the mirror and what directly enters, over the course of a day. Half of that would be blocked by the membrane and plastic, so 425 kW enters on average. Limiting heat loss by radiation is simple through use of MLI, which is light and so costs little to ship from Earth. Sheets of it would cover the exterior walls. Below is an illustration of how heat would spread outwards from such a structure. This article says temperatures in the ground are 'fairly constant' at depths of 2 m, and are 'around -30 to -40 degrees C'. Let's call 3 m the depth at which temperatures are constant. 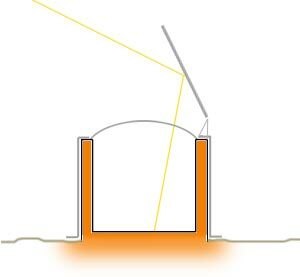 If there is a 3 m skirt of MLI around the base of the cylinder, the beginning of the gradient between the surrounding soil and the greenhouse is a figure following that 3 m distance from the structure's thermal mass. Temperatures outside that area have no bearing on interior temperatures. Now the math for how the heat in this system would move around over the course of many lunar days and nights before it found an equilibrium is very much beyond me, but with some rough calculations based on all the figures listed, it seems like that equilibrium could yield a fairly constant, comfortable temperature. Is that true? I've assumed that all the contents of the greenhouse add up to 5000 m3 of stuff (10% of volume) with an average density of 1200 kg/m3 and average specific heat of 2 kJ/kgK. The sunlight into this system would be enough to heat everything in it by about 8 Celsius in one lunar day once the heat was evenly distributed. At first some of that would get sucked into the ground under the greenhouse but soon that would be saturated with enough heat to stop it from doing that any more. Some would be lost through the transparent dome. I don't know how much that could be, but I don't think it would be enough to stop the greenhouse slowly heating up. How would I calculate that? Then some heat would be lost over the course of the lunar night. Fine-tuning for cooling is easy, by maybe keeping part of the walls in shade uncovered by MLI so they radiate heat slowly, or turning the mirror a little so it reflects in a bit less light, but I don't know how much difference that would make. A temperature fluctuation over one complete lunar day within 10 or 15 Celsius would be fine. As long as temperature doesn't change rapidly plants adapt well. "Once you get down to 2 meters under the surface of the Moon, the temperature remains fairly constant, probably around -30 to -40 degrees C."
The idea of storing heat long term is called seasonal thermal energy storage, there are also passive versions. Within the human comfort range between 20–30 °C, some PCMs are very effective. They store 5 to 14 times more heat per unit volume than conventional storage materials such as water, masonry or rock. Therefore a PCM could be used to finely regulate the temperature without any need for active controls. Unfortunately as they are usually carbon based materials, it might not be possible to create them in-situ. Without a PCM or active thermal storage using pumps, the system will necessarily undergo temperature fluctuations, it will warm up at least somewhat during the luna day, and cool down at least somewhat during the luna night. This could be kept to almost arbitrarily low levels by making the system big enough, if there is enough internal thermal mass then temperatures will remain fairly regular. However with modern passive heated houses such as Earthship temperature regulation still relies somewhat on selectively admiting or blocking sunlight, and exploiting the coolness of the Earth. It's impossible to say just how big a purely passive system would have to be, that's because it depends on how regular you want the temperature to be - and for an intensive greenhouse you probably want very regular. The problem isn't so much keeping the heat in - that's mainly a matter of using enough insulation. The problem is getting rid of excess heat during the day as the dome on the whole would be well insulated. It means there must be enough thermal mass to soak up the sun's heat for 15 days, without significantly increasing in temperature, or more of the sun's heat must be rejected by radiators, or by selectively reflecting more of the sunlight. However there is a serious hazard in any system which is exposed directly to the sun/space - that is cosmic and solar radiation. Generally radiation is not harmful to plants, but it would be extremely hazardous to humans and animals working or living in the dome. Since the LED lights are already required anyway, we may as well avoid the radiation hazard and expense and complexity of the shutters and just make the greenhouse fully isolated from the sun, whatever generates electricity for the night time lights would probably generate enough waste heat to heat the greenhouse too - or you could store some heat using a solar water heater to heat water which is pumped into an insulated tank. The idea of a passive dome would work quite well for large domes, large enough to have enough mass of air to provide a barrier to radiation, and to have soil, lakes and buildings for internal thermal mass, and large enough to justify using orbiting mirrors to provide sunlight during the luna night. The dome would need to be quite large - for adequate radiation shielding a dome with a radius of 1km with an air pressure of 1 bar would be appropriate (this reduces radiation by 99% in the center of the dome - less towards the edges), but we're talking here a city rather than a greenhouse. So my conclusion is that it's a practical idea at the scale of mega-engineering, but not at a small scale. Not the answer you're looking for? Browse other questions tagged the-moon colonization habitat thermal-control or ask your own question. Is long range radio communication possible on the lunar surface? When estimating radiation doses inside a lunar habitat, what assumptions are made as to shape? Which is easier to build on mars per square kilometer; greenhouse windows or photovoltaics/LEDs? How is lunar regolith drawn into “glass fibers” to reinforce lunar concrete in this process?